At Dolphin Scuba we have swim products to suit your needs. A pair of goggles is one of the basic pieces of equipment you can purchase when learning swimming. More then likely it will be the most important purchase simply because if you have trouble seeing while you swim it can be quite distracting. At Dolphin Scuba we carry a line of Aqua Sphere goggles which will fit toddlers through adults. 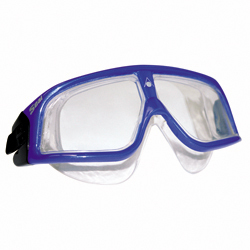 We also carry prescription goggles as many accessories for swimming such as: swim caps, ear plugs, hand paddles, neoprene swim gloves, kick boards, swim fins and more. Whether you are taking swim classes at Dolphin Scuba or swimming on your own we have what you need. Come check it out and buy today.